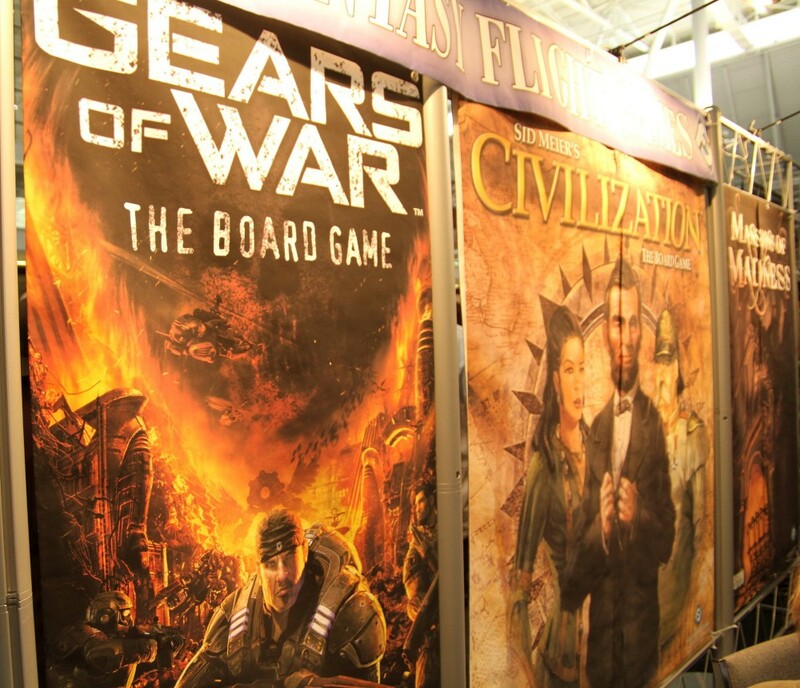 I think the obvious response to the Gears transition to a board game is to worry that the intensity of the video game's action will be lost to a more turn-based system of play. 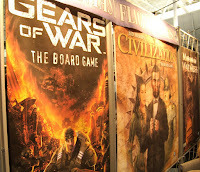 I think that's fair, since board games are mostly and traditionally turn-based. BUT it's worth noting that it doesn't necessarily have to be the case. Or you could consider games like Liar's Dice, where there is never a point where it ceases to be your turn. All that changes is the type of move you're allowed to make (e.g., raise bet or challenge bet). Considering these kinds of tabletop experiences, as opposed to the ones where players are idle until their next turn, I think it would be possible to create a Gears tabletop experience that created tensions and allowed everyone at the table to feel like they had input at all times. It obviously wouldn't be the same as the video game experience, but it would be the best kind of tabletop interpretation, I think. Do I think this is how the game will be, though? I feel like probably not. My gut tells me it will probably be some kind of tactical RPG sort of system. Possibly punctuated by some kind of tension-raising "duel" mechanic to simulate gun fights, if anything, but probably tactical RPG. If they do manage to make it in such a way that maintains continuous tension and activity of some kind, I will be pleasantly surprised! But they could do it! Video games have the freedom to not reveal all the rules of the system. This sets up a number of situations that the player can create just to see how the game world will respond to it, as well as other situations which will just be cool to find out through dumb luck. Specifically I'm thinking of Bayonetta, wherein you can equip fire gauntlets on your feet, and this allows you to walk unharmed over lava. It's not required to advance, the game never mentions it, but it is a rule of the system. There are mechanics for the player to discover, which can be at least as fun as finding new environment and treasures and what we commonly think of. It's basically why emergent gameplay is fun, I'd say. Board games can't afford this. Like you talked about, when players sit down to a board game, they need to take time to learn the rules. All of them. If there comes a time when a situation arises in a play session where there is no rule that dictates the outcome, the game stops. Well, in a purely logical system it would. With actual players in control, we know that's not what happens. Players argue, discuss, and come up with a "house rule" for that situation. That's pretty simple, and as long as players are okay with making up some rules, things move on. I think it begs a question, though. Personally, I feel that if a situation comes up that the rules don't cover, the designer had a lack of forethought in design. Or at least didn't have enough play testing sessions to find that flaw. Either way I can usually get over it (and maybe make the game better along the way). But what about games which foster or allow freedom in rules? Last night My friends and I played Fiasco, which is a collaborative role-playing / storytelling game. But the game was so focused on the storytelling that there actually wasn't much of a game. A lot of times we threw away what the rule book said and used our own rules. We had a lot of fun "playing", to be sure, but in the end I felt kind of gypped. I felt that we hadn't actually played a game. But I'm not sure, and maybe I'm the only one who thinks that it's cheating for a designer to release a suggestion of a game as a game. If the players can throw away your rule book and not be all that affected, then you can't have really done all that much. Also, I've played pandemic and it was really fun. But talking about it afterwards we thought about it and came to the conclusion that there was no real reason why it couldn't have been a solitaire game. Having multiple players didn't do anything for it. To be fair, most beat-the-box games are like this, but there can still be some competitive aspects between players that make the experience require that not all the players are playing from the same standpoint. I was a big fan of Risk: Factions for XBLA and PSN. While Risk obviously benefits from player interactions (ex. alliances and the breaking thereof), this digital version made up for it with great battle animations, an interesting and challenging (if short) campaign, and even a more complex ruleset well-suited to the video game medium. My friends and I frequently played local multiplayer, even though I owned the board game. It was just easier to "set up," and the different rules and maps made it a bit more engaging. The only problem, really, was the player limit, down to 5 (4 locally) from the board game's 6. Great point about the "always your turn" style board games. Maybe the cover mechanic can be addressed this way; you'd always have to be worrying about your positioning, lest other players get a chance to call you out (i.e. shoot you!). I've watched a little bit of Risk: Factions and it seemed like a smart interpretation that took advantage of the medium. That's a pretty odd about the player limit; whatever happened to just passing a controller around, right? The spam filter initially ate your comment; sorry about that! Interesting point about the differences between emergent rules in board games and video games. Like you, I tend to enjoy fairly explicit and comprehensive rule systems. However, I definitely see the appeal of allowing the player the freedom to modify and tweak the systems. It's hard to have "house rules" in a video game specifically because of the inflexibility of many digital systems.